, bishop of Chichester in the seventeenth century, was eldest son of the preceding, by Jane, daughter of Mr. Henry Freeman of Staffordshire, and was born at Wornall in Buckinghamshire in January 1591, and educated in grammar learning partly in the free-school at Thame in Oxfordshire, and partly at Westminster-school, from which he was elected a student of Christ church in 1608. On June the 19th, 1611, he took the degree of bachelor of arts and July the 7th, 1614, that of master. He then entered into holy orders, and became an eminent preacher, and chaplain to king James I. 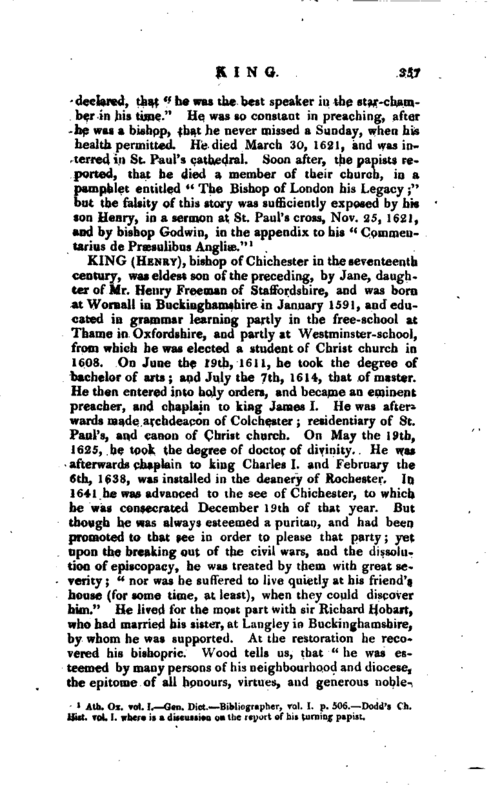 He was afterwards made archdeacon of Colchester; residentiary of St. Paul’s, and canon of Christ church. 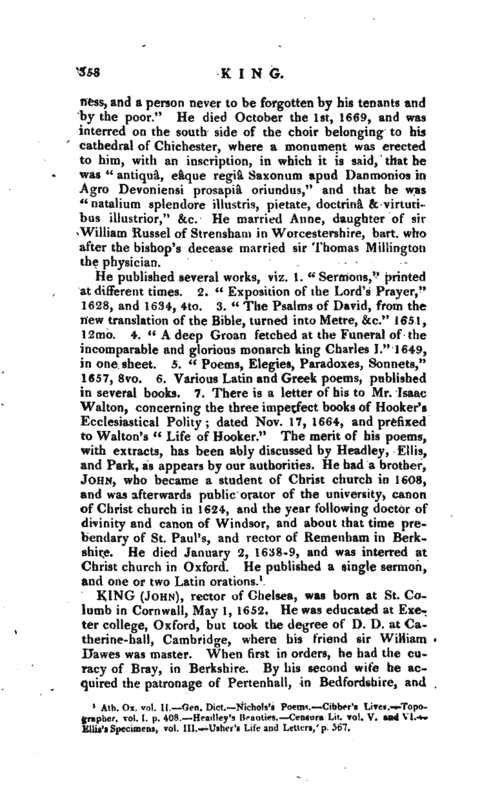 On May the 19th, 1625, he took the degree of doctor of divinity. He was afterwards chaplain to king Charles I. and February the 6th, 1638, was installed in the deanery of Rochester. In 1641 he was advanced to the see of Chichester, to which he was consecrated December 19th of that year. But though he was always esteemed a puritan, and had been promoted to that see in order to please that party; yet upon the breaking out of the civil wars, and the dissolution of episcopacy, he was treated by them with great severity; “nor was he suffered to live quietly at his friend’s house (for some time, at least), when they could discover him.” He lived for the most part with sir Richard Hobart, who had married his sister, at Langley in Buckinghamshire, by whom he was supported. At the restoration he recovered his bishopric. Wood tells us, that “he was esteemed by many persons of his neighbourhood and diocese, the epitome of all honours, virtues, and generous | nobleness, and a person never to be forgotten by his tenants and by the poor.” He died October the 1st, 1669, and was interred on the south side of the choir belonging to his cathedral of Chichester, where a monument was erected to him, with an inscription, in which it is said, that he was “antiqua, eaque regia Saxon urn apud Dan monies in Agro Devoniensi prosapia oriundus,” and that he was “natalium splendore illustris, pietate, doctrina & virtutibus illustrior,” &c. He married Anne, daughter of sir William Russel of Strensham in Worcestershire, bart. who after the bishop’s decease married sir Thomas Millington the physician. Ath. Ox. vol. II.—Gen. Dict.—Nichols’s Poems.—Cibber’s Lives.—Topo grapher, vol. I. p. 408.—Bradley’s Beauties.—Censura Lit. vol. V and VI.— Ellis’s Specimens, vol. III.—Usher’s Life and Letters, p. 567.